San Juan: Looking for beaches to run in the San Juan area? Isla Verde and Carolina Beach are both great options nearby the city. 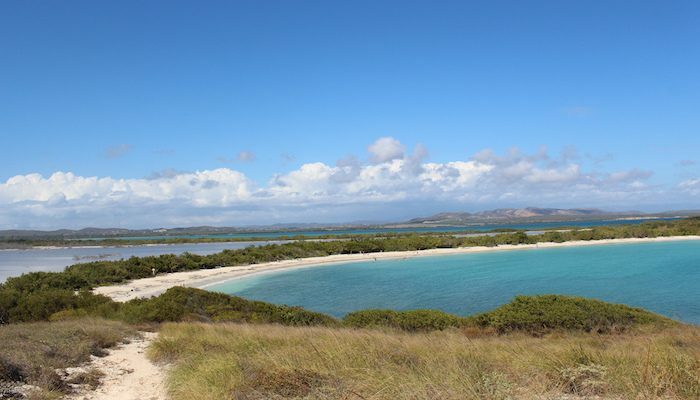 Parque Nacional Balneario Boquerón: Widely considered the best beach for running in Puerto Rico, the wide flat sands of this Cabo Rojo beach stretch for about 1 mile across the national park. If your legs tire of running on sand at any point, there are compact dirt paths and sidewalks just inland from the beach. MAP. Playa Sucia and Adjacent Coastal Paths: Don’t be fooled by the name, this lovely patch of sand in Cabo Rojo is anything but “dirty.” Though slightly smaller than Boquerón, Playa Sucia is a secluded crescent of beach with equally runnable sand. The beach itself is only about 0.3 miles long, but there are coastal paths on either end of the beach, leading to spectacular coastal points, which more adventurous trail runners will love exploring. MAP. Parque Nacional Balneario Manuel Morales: This national swimming area located in Dorado is another wonderful running option, with wide compact sand, parking, restrooms, and even a shady paved walking path on the inland shore. The beach is about 0.5 miles long. MAP. Punta Salinas: Somewhat less crowded than the national park beaches, Punta Salinas is a nice little Balneario with about 1 mile of runnable shoreline. There is also a shady, compact dirt trail where runners can form a return loop out of the sun. MAP. Puerto Nuevo: Puerto Nuevo in Vega Baja is beloved for its golden sands and scenic limestone cliffs that break incoming waves. The sand here is on the softer side, but usually runnable at low tide. If it’s too much of a slog, runners can take to the ¼ mile concrete sidewalk that spans the length of the park. Cerro Gordo: Cerro Gordo has great trail running options on its namesake mountain bike paths, but the beach here is long and flat enough to run as its own route, or in combination with the trails. It’s not the best sand on the island for running, but it’s more runnable at low tide.